Animated series. Hiccup and Toothless are captured and must find a way to escape the Dragon Fighting Arena and survive an attack from the fearsome triple stryke dragon. Browse content similar to Stryke Out. Check below for episodes and series from the same categories and more! This dragon fight is one for the ages! Always a pleasure to have you join us. Why didn't you bite him? This is not the amount we agreed upon. the fights are over before they start. No-one will pay for a fight that ends in five minutes. But if I were you, I'd find a solution to turn this around. You call this a battle? Time for a nap. Oh, I hate that guy. The dragon hunter base is just up ahead. Now remember, approach with caution. They might be expecting us. This is the easiest mission ever. We fly in, blast the hunters, and then be home in time for lunch. This place was crawling with dragon hunters this morning. -Did you see anything else? Any dragons? Yeah, really wrong. Come on! Why'd you tell me to be proactive today? You know, I think we've seen way too much of this place already. Maybe it's time to head back. What do you think, Hookfang? Ah! Yes, that was before the bloodcurdling dragon screams. So, Hiccup. Question, question, question. without being, er, I don't know, eaten alive? There's got to be a switch or a lever somewhere. Once we get them free, we'll just wait them out. I'll get you out of there! OK, bud, time to go! Go, go, go! Get help! They were right here! I swear! I'm sure Stoick will forgive you for losing his one and only son. and then gassed with dragon root. But why bother knocking them out? The dragons were already captured. To keep the dragons pacified to make them easier to transport. So Hiccup and Toothless are now being taken to Thor knows where? Great. And we have no way of finding them. and one toothless Night Fury. Yes, that's right, young Snotlout. My brother and I are experts in the delicate and fine arts of detection. We are Thorston and Thorston, sleuths extraordinaire. 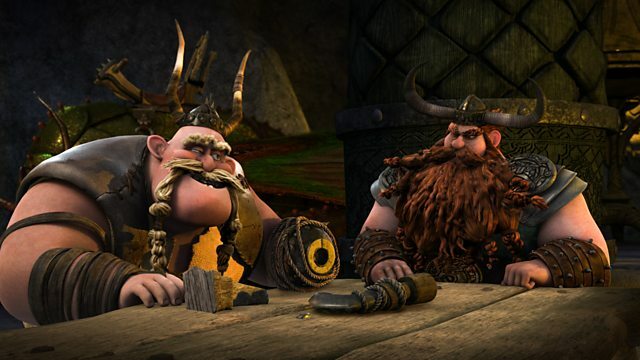 The best detectives on Berk. Well, really, the only detectives on Berk. Sh! They don't know that. The dragon hunters have taken Hiccup and Toothless somewhere nefarious. -Not now, Heather. I'm detecting. Someone with inside knowledge of the dragon hunter ports. Someone like Heather! Thank you, Thorston. We have got to get out of here. That's right, you smelly beasts! You know who the boss is! He was with the Night Fury. Oh, I've heard about him. He's a friend to dragons. Good. Then maybe he'll be useful. I've got a very special event planned for his dragon. Don't you worry, my friend. And don't touch that muzzle! Ladies and gentlemen, get ready! Tomorrow night, two new dragons enter the ring in a battle royale. Only one dragon will leave victorious! Oh, I've never seen a Night Fury. Hey, got to back off, bud. They're starving, injured, and scared. That's one of the main dragon hunter trading ports. These hunters will know where Hiccup and Toothless have been taken. Where is the Night Fury? Excuse me, can any of you tell me where the Night Fury has been taken? Hi, I'm looking for a one-legged Viking and a Night Fury. Leave this to us, Snotmaster. Thorston and Thorston are on the case. Tell me where Hiccup and toothless have been taken! Where? It's my turn to be bad Viking. Ugh! Can we talk about this later? You're kind of ruining my vibe here. No, we should talk about this now. Tuff, not in front of the suspect. -If not now, then when? You want to do this here, right now? Someone else should have a chance to be bad Viking! Hey, you were bad Viking last time! and I offered the suspect cookies. Every time, Tuff, you do this. You take over my interrogations and ruin them. Have you two muttonheads gotten any information out of this guy yet? He was just about the crack, but someone ruined it! He was never going to spill the beans the way you were grilling him. You shouldn't be grilling beans anyway. -Why do we trust you two with anything? -I'll get him to talk. Another hunter just gave up where Hiccup and Toothless are being held. -He was going to be spilling and grilling. -Would you two just go? He was going to grill and spill those beans. We've got to warn Ryker. The dragon riders are going to attack the dragon fight. So the twins didn't get any information out of that guy? What do you think? Of course they didn't. whose name rhymes with "Gastrid,"
and we're going to follow it. In the sleuthing business, we call this tailing. In the idiot business, we call this the twins. Hey, look, a delicious rock. All right. Come on, then. Now get the Night Fury. You stay away from him! Toothless, get out of there! No, no, no, Toothless. No! You did it, bud. You did it. Night Fury! Night Fury! Night Fury! Tell Ryker I found the solution to both our problems. You did a great job today, bud. I'm sorry. I know, I know. made you a nice fortune, now you need to let us out of here. Vikings will come from all over to see it fight. Night Fury, meet your next opponent. Hiccup and Toothless have been taken to dragon fights down there. Forcing dragons to fight each other? when they find out it's a Night Fury that's fighting. Hiccup and Toothless need us. We can't do that, Snotlout. You saw that chain dome. There's no way we can get in there. We'll use our superior "slauthing" skills. Er, no offence, but your sleuthing skills haven't gotten us very far. Remember, we're masters of infiltration. Hey, I've seen this before. but I'd prefer to not lose another limb. Oh, it's all right. It's OK.
You make sure the lock that manacle tight. A Razorwhip tail can cut through anything. Great fight tonight. Great fight. I have a new challenger for the Triple Stryke. OK, infiltration plan number 34. You got it? Gentlemen, we are Thorston and Thorston. We've been tailing a very dangerous suspect who's inside. a hefty reward will be coming your way. Oh, yeah, mad bricks of gold, my Viking. Er, what are you doing? Ah, no. Pretty sure it's 34. You and I need to have a discussion about our numbering system. Oh, boys! So, what do you say? Will you help us catch our suspect? Fine, you can go through. But I want the bricks first. Sure, they're right over here. Ladies and gentlemen, this is the main event! versus the newcomer, the Night Fury! A Night Fury? Stop the fight. We need that dragon alive. Do you want a riot on your hands? Oh, you don't have to worry about him. If the Triple Stryke kills that Night Fury, I kill you. There's only one way Toothless is going to survive. I'm fine, but it's Toothless I'm worried about. And now for the final strike! I would get out of here if I were you. It is good to see you too, bud. Justice! Get your justice here! I'll give you dragon fighting. Come on, girl, put your meat into it. -He's been in captivity for too long, Hiccup. He doesn't know how to be free. Ha-ha. Well, I wasn't worried for a second. Astrid would've killed you if we hadn't found Hiccup. Look at that magnificent creature. I shall name him Sleuther! Hiccup, I think he wants to come back with us. Sleuther, I think you'll like the Edge.